No one loved telling stories quite like Ernest Hemingway loved telling stories. 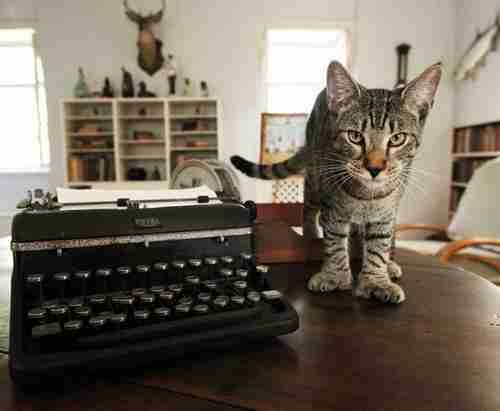 Like most grand storytellers, the writer also had a fervent affection for local legends, which is how he became smitten with the idea of owning a six-toed mitten cat. Back at the turn of the century, sailors believed that six-toed cats, also called gypsy cats, were good luck, and they wanted them aboard their ships. This led to an abundance of six-toed cats in porttowns like Key West, Fla., in the thirties and forties. Soon after Hemingway settled in Key West in 1928 and learned of this lore, he made it known around the ports and, more importantly, the bars, that he wanted a gypsy cat of his own. 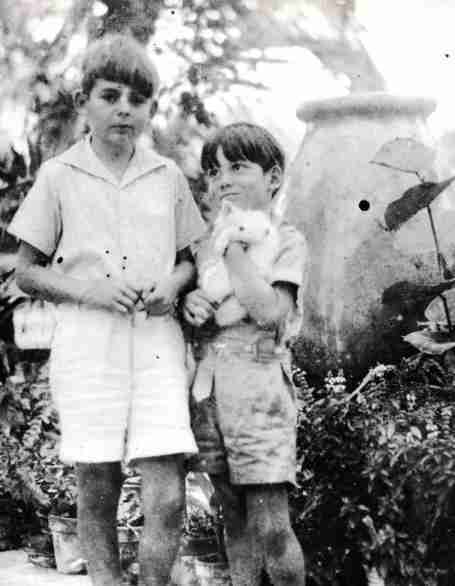 A captain named Stanley Dexter, trying to curry favor with the famous author, gave Hemingway his first six-toed kitten, Snowball, daughter of his own cat, Snow White. 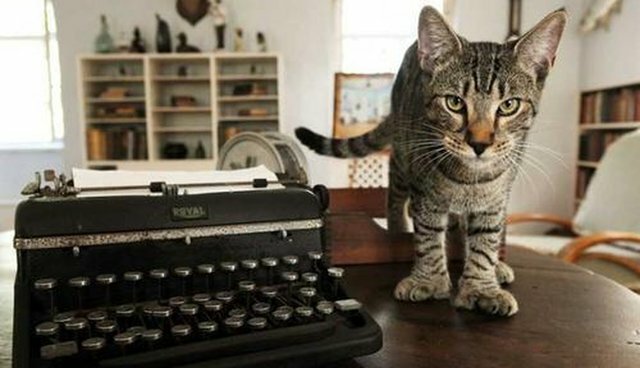 It does not take two six-toed cats to produce another, and soon Hemingway's estate was home to more than 50 cats, many of them with an extraneous digit. 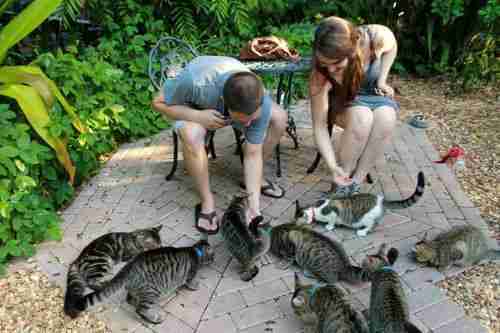 When asked why he had so many six-toed cats, the write replied simply, "One cat leads to another." Today, Snow White's descendants roam the lush garden grounds of Hemingway's Spanish Colonial mansion as though they own the place. "About half of the people who come here come for the cats - not the architecture, not the literature, the cats," said Dave Gonzales, the house's curator. Hemingway named most of his original cats after famous people, and that tradition continues today with Frank Sinatra, Olivia de Havilland, and Truman Capote (not to be confused with Harry Truman) roaming the grounds. Gonzales is about to launch a smartphone app for the property. Along with logging the antiques, furniture, and literature in the house, the app will catalog all of the cats by name and tell you where they like to hang out on the grounds. For instance, you can search for Ivan the Terrible. He is big and orange, and he typically lounges poolside. How does anyone even keep track of 55 cats? Well, it takes a ton of planning and a bit of ingenuity. Cats, unlike dogs, can be relatively self-sufficient, but that doesn't mean they don't need human care to stay healthy and robust. Kitty inoculations are staggered. The vet visits every Wednesday. "Our cats are seen more in a year than a normal cat is seen in its lifetime," Gonzales said. Before they are spayed and neutered, the cats live in a kennel in the evening that is an exact replica of the Hemingway house, right down to the yellow shutters. Once they have one litter, they are spayed and neutered. The house goes through two tons of dry cat food a year, about 60-80 pounds a week. There are nine food and water stations on the property, and they are refreshed every eight to 12 hours. The bookstore on the grounds was originally intended to be an actual bookstore, but it is really more of a gift shop, with at least half of the items devoted to cats. Pablo Picasso once gave Hemingway a porcelain cat. The shop sells $150 reproductions that are constantly selling out. "We get all the crazy cat ladies who just have to have them," Gonzales said. Visitors are always asking if they can bring toys for the cats. Gonzales says yes, as long as they are discreet about it. There is even a wedding package called "The Cats Meow," which includes a one-hour site rental, an onsite wedding coordinator, and a complimentary champagne toast for $1,095. The cats are not particularly involved. Here's the added value of the cats - they make what could be an incredibly boring tour for younger kids a little bit delightful. One recent TripAdvisor review praised the cats as having saved the day for one dad. "We went to this with four kids, ages 7, 10, 10 and 15. ... One ten-year old sat on a bench for a minute and a cat hopped in his lap and fell asleep. The other ten-year-old must have taken 100 pictures of cats. I think she counted the toes on every cat.....all in all we ended up spending two hours here with no one complaining about let's get to the beach." There's a pretty strict no touching policy with the cats, unless they touch you first. "You see people grabbing them and holding their paws so that their friend can take a picture. You can really sense the cat's frustration. They don't want to be restrained. So we have to have rules," Gonzales said. Still, cats know when you like them and are happy to leap purring into your lap with little provocation. "We came here for the cats. Definitely the cats," said college student Scott Franklin from Washington, D.C., as he scratched one tabby behind the ear. "I come here every year with my family, and this is one of my favorite parts of the trip." I had to ask Gonzales, very obviously a cat enthusiast himself, a question. 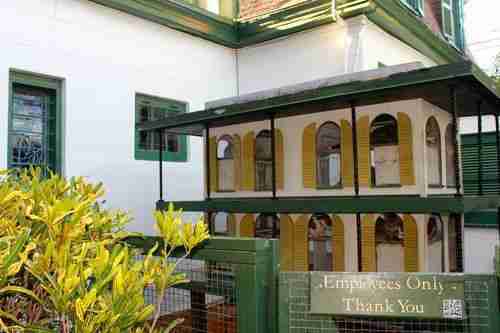 Could you work here if you didn't love cats? "Why would you want to?" Linda Mendez, who was working in the bookstore chimed in.